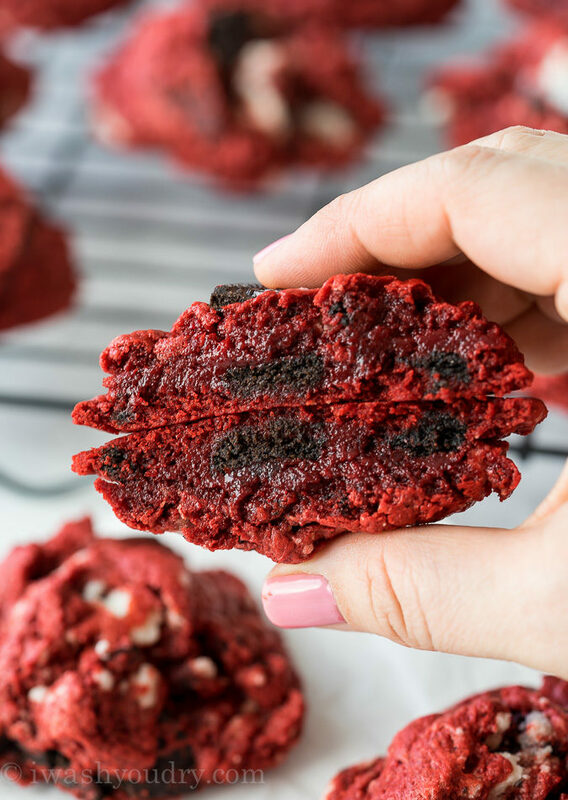 These Red Velvet Oreo Gooey Butter Cake Cookies are just 5 ingredients to make and are so good you’ll be making them over and over again! Now that the Super Bowl is over, (go Patriots!) 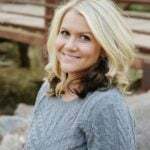 let’s talk about Valentine’s Day!! You guys, I’m the WORST when it comes to cute and crafty things for Valentine’s Day. I’m lucky if I can even get to the store to buy my kids a heart shaped box of chocolates. 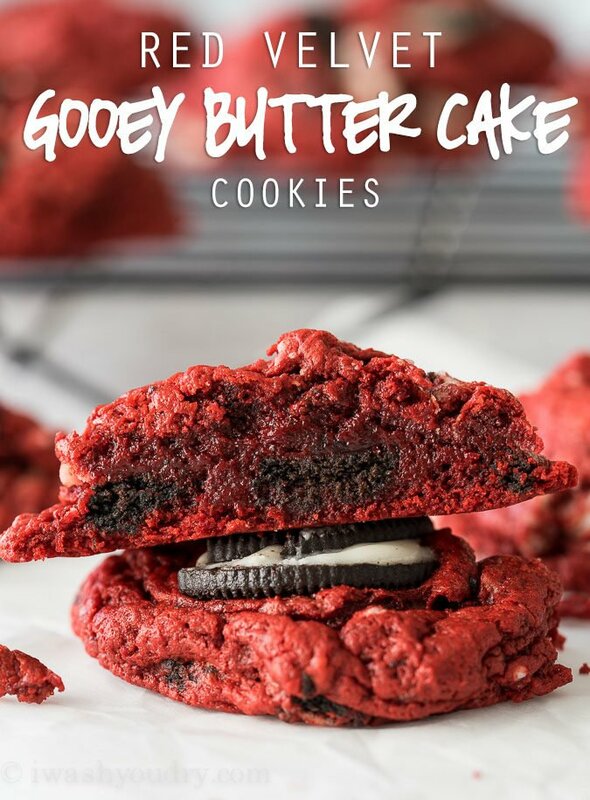 But what I am good at, is making super easy treats like these Red Velvet Oreo Gooey Butter Cake Cookies. 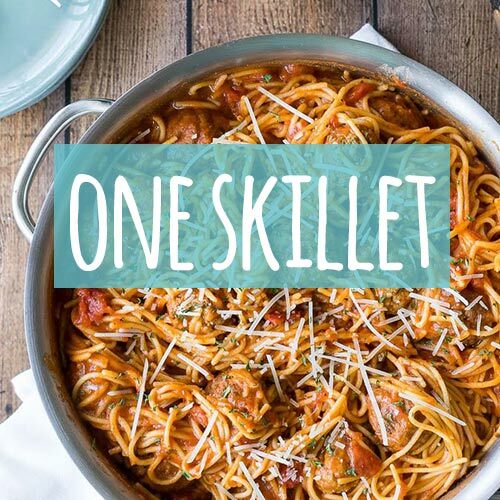 After all, they’re just 5 ingredients! So easy! If you’ve ever made a gooey butter cake before you know how dang delicious it is. I’ve taken the same concept for a gooey butter cake and made it into a delicious, bite-size cookie! 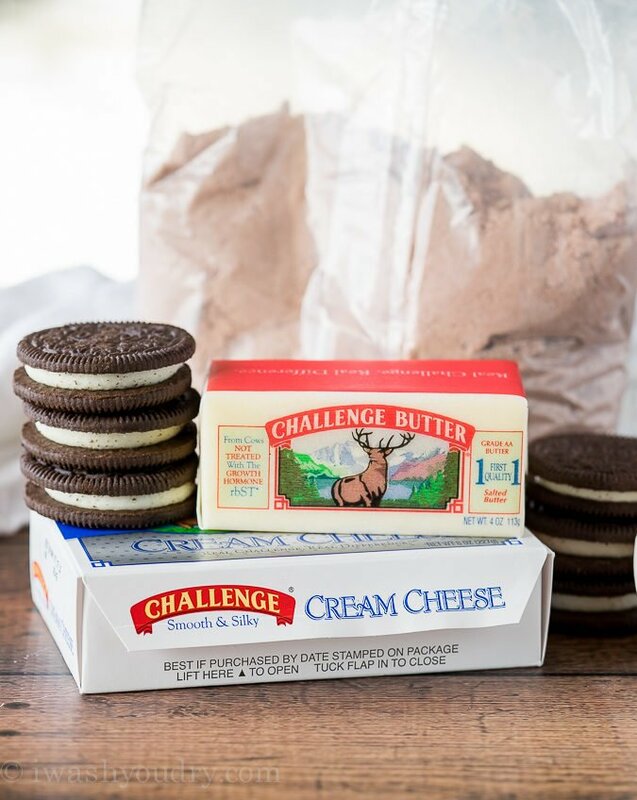 You’ll want to start with some Challenge Butter and Challenge Cream Cheese. Did you know that Challenge’s butter and cream cheese go from the farm to the fridge in just 2 days? It doesn’t get any fresher than that! Only the best!! Remember to look for the elk on the package, so you know you got the good stuff! 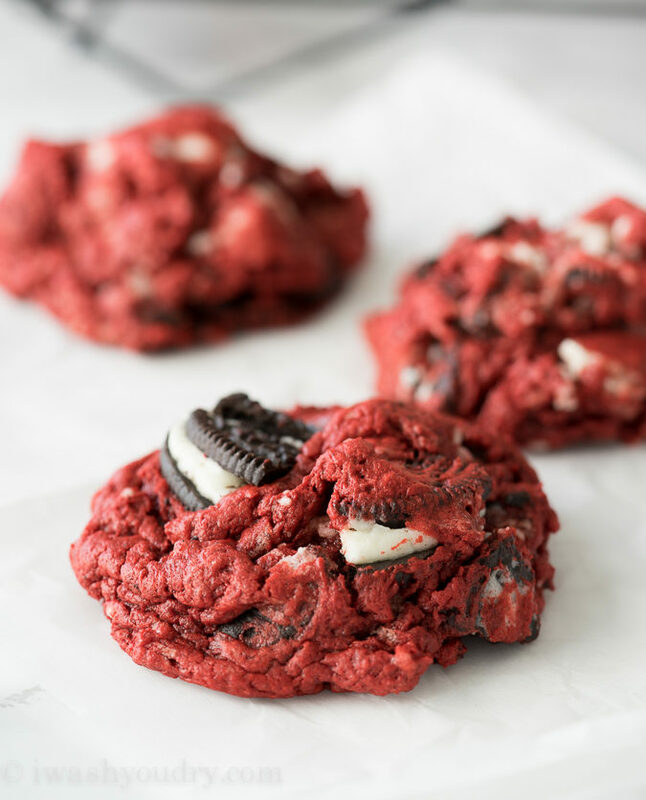 You’ll beat the cream cheese and butter together until nice and fluffy, then add an egg and a red velvet cake mix. 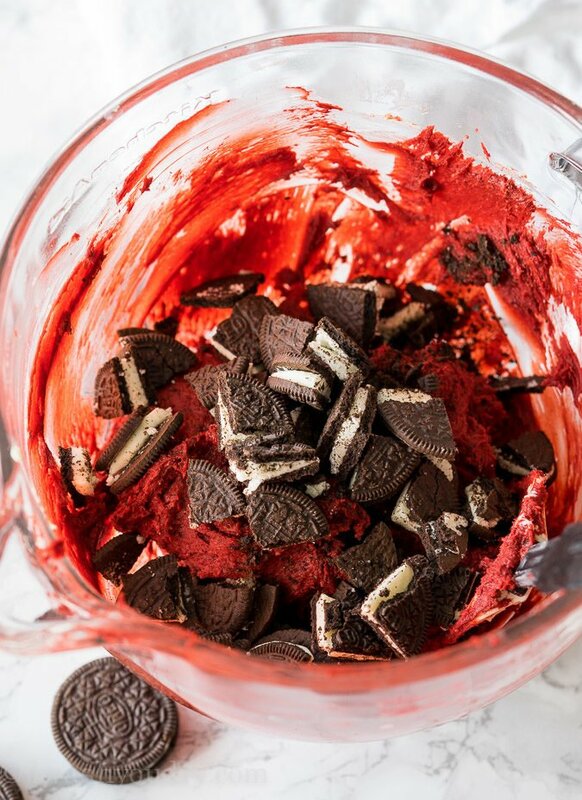 This will become your cookie dough. It’ll be a little sticky, so don’t worry. 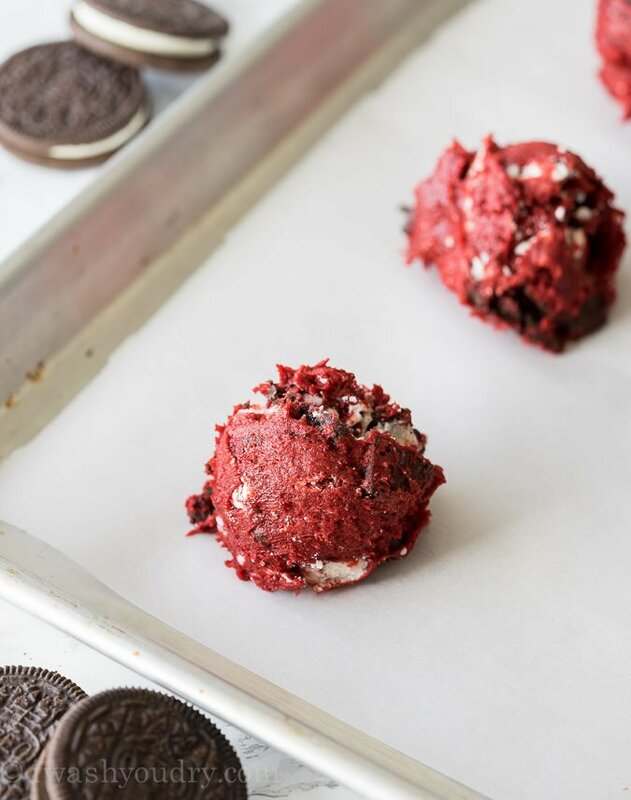 Fold in some chopped up Oreo cookies and then pop it in the fridge to chill for just a little bit. Scoop the cookie dough onto a parchment lined baking sheet and bake them for just 10 to 12 minutes, depending on the size of your cookie. My cookies were rather large because I used an ice cream scoop to them, so I baked mine for 12 minutes. If you use a smaller scoop you’ll want to stop at 10 minutes. 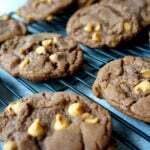 The cookies will be soft when they’re done baking so carefully place them on a wire rack to finish cooling. Once they’re cool you’re going to want to show some self control. These cookies are seriously so good. So soft and gooey in the center, with little bits of cookies and cream throughout. Not too sweet, just right! Prep Time: 1 hr. 10 min. 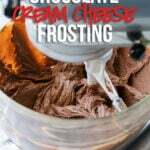 Combine the Challenge Cream Cheese and Butter in a large bowl and beat with a mixer until soft and fluffy. Add the egg and cake mix and beat until a soft dough forms, scraping down sides of bowl as needed. Add the chopped cookies and fold into the dough. Chill the dough for at least 1 hour. Scoop the cookies into large balls (I used an ice cream scoop) and bake for 10 minutes (for smaller cookies) or 12 minutes (for larger cookies). Let cool for a few minutes before transferring to a wire rack to cool completely. Enjoy! Disclaimer: This post is in partnership with Challenge Butter. All thoughts and opinions are 100% my own. Thank you for supporting the brands that help make I Wash You Dry possible. I’ve made these before and loved them! I’m wondering if they will freeze well? 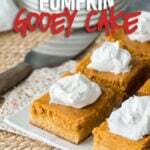 I want to make them today and freeze for thanksgiving day. Definitely! They would freeze great! Enjoy! These came out so good! I love how soft they were in the middle, definitely a cookie that I’ll be making over and over again. 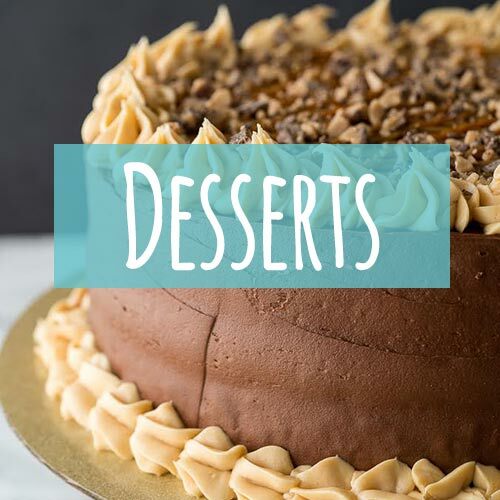 And yes, that butter and cream cheese definitely makes a taste difference! YES! So glad you loved them! That Challenge Butter and Cream Cheese really does make a difference, doesn’t it! You would post something so luscious when I am dieting! It would be nice if the nutritional value was provided so I can incorporate two of these luscious looking beauties, lol. Thanks for sharing!!! Sorry about that! The struggle is real! Oh my gosh! These cookies look beyond delicious!! Can’t wait to give these a try! 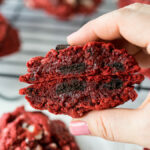 Can you make these without the Oreos? Definitely! You can leave them out or you can sub them with something else, like white chocolate chips or sprinkles! You should get about 2 dozen medium size cookies out of this.